sister projects: Wikipedia article, Commons category, definition, Wikidata item. Fantasy is a genre of fiction that uses magic and other supernatural phenomena as a primary element of plot, theme, or setting. Many works within the genre take place in imaginary worlds where magic is common. 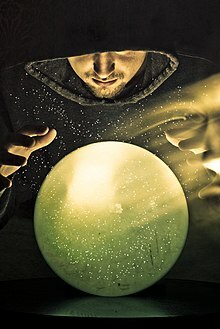 Fantasy is generally distinguished from science fiction and horror by the expectation that it steers clear of (pseudo-)scientific and macabre themes, respectively, though there is a great deal of overlap between the three, all of which are subgenres of speculative fiction.— Excerpted from Fantasy on Wikipedia, the free encyclopedia. High fantasy or epic fantasy is a subgenre of fantasy defined as fantasy fiction set in an alternative, entirely fictional ("secondary") world, rather than the real, or "primary" world. The secondary world is usually internally consistent but its rules differ in some way(s) from those of the primary world.— Excerpted from High fantasy on Wikipedia, the free encyclopedia. Low fantasy is a subgenre of fantasy characterised by being set in the real ("Primary") world, or a rational and familiar fictional world, with the inclusion of magical elements. Low fantasy can be described as non-rational events occurring in a rational setting. It is important to note that the use of the word "low" is not an indication of quality but of the relative level of "fantasy" contained within a particular work of fiction.— Excerpted from Low fantasy on Wikipedia, the free encyclopedia.